Explore our list of the most talented jazz bands in PA. Find the best jazz bands in Pennsylvania. See a Jazz Show by Edwise in Philadelphia! 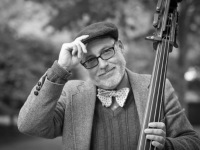 As a string bass player, Edwise has spent his whole life playing jazz music. Originally from New Orleans, Edwise arrived in Philadelphia in the wake of Katrina and has built his Jazz music career in Philadelphia ever since. Appearing at Jazz festivals and other performances, Edwise is sure to offer a performance near you! His CD, "Ed Wise and his New Orleans Jazz Band," can be listened to and purchased on his website, so go check it out now! Also, take a look at his upcoming performance schedule so you can start planning your next Edwise jazz show in Philly! One of the Best Jazz Bands Pennsylvania Has To Offer! Who was that blowing their horns and tearing up the Westmoreland Arts & Heritage Festival? It Was Big Fat Jazz, a seventeen piece jazz and swing outfit that wants to play your next event until everyone is out of their chairs, dancing and grooving along. This is a high energy show provided by real professional musicians, dedicated to their musical craft, playing their hearts out every chance they get, and keeping the spirit of their idols jazz idols (like Duke Ellington and Maynard Ferguson) alive. 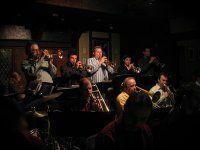 If you're looking for power and skill, fused classic and modern style, hot and smooth running jazz, you need one of the best jazz bands in Pennsylvania: Big Fat Jazz. One of the Top Jazz Bands in Pennsylvania! The Craig Satchell Jazz Ensemble is just who you've been looking for to play your next party, corporate event, or engagement. The Ensemble is customizable, ready to bring the members it needs to play the sound you want. If you have a passion for smooth jazz, a love the golden classics of the great American songbook, or still play for yourself the hits of Count Basie or Louis Armstrong, you need to book Craig Satchell and His Band. You won't believe the energy, the encompassing sound, the recreation of a style long thought dead, until you're on your feet dancing along. Don't wait; contact them today! The Band That Celebrates the Love of Swing and Jazz! The Jazz Celebration Big Band is a big band indeed, with over seventeen members (including wonderful vocalist Claudia Perry) blowing horns, banging drums, strumming guitars, and banging the keys (not to mention singing her heart out) to bring you a swing and jazz fusion unlike any you've ever heard live. Who said that the big band died out in the fifties with Glenn Miller and Tommy Dorsey? The age of the wailing trumpet, and the constant bouncing rhythm of the band is alive and well anywhere the Jazz Celebration Big Band is playing. You only have to hear it believe it, so don't hesitate to be a part of their next performance. One of the Finest Jazz Bands PA Has To Offer! 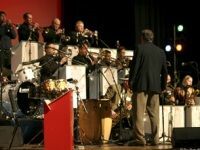 The Jump City Jazz Orchestra has been causing toes to tap and bottoms to wiggle since 1994. In that time they have covered the gamut of jazz and big band music from Count Basie, to Ella Fitzgerald, from Glen Miller to Big Bad Voodoo Daddy, and Frank Sinatra. There is a certain magic about this music, a mystery to the way it uplifts the soul, and gets people moving, and it is to this magic and mystery that The Jump City Jazz Orchestra have dedicated themselves to mastering over long years of experience. You will never have a night quite like this, give them a try, and see what we mean. The Monday Blues Jazz Orchestra has grown from its original modest purpose of providing amateurs a place to hone their skills in the 60's to an over twenty member, professional, hopping outfit that will blow you away. 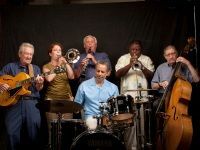 Whether you're hosting a wedding, party, retirement, corporate event, or music festival, you have to get the Monday Blues Jazz Orchestra in on the fun: their unique blend of classic swing and jazz energy mixed with contemporary grooves are more than enough to get you up and moving and humming along. The Orchestra bills itself as "top notch entertainment," and we're inclined to agree. Bringing Beloved Old Classics To Life! 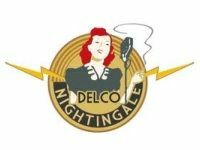 The talented performers that make up Delco Nightingale, despite musical tastes that vary through jazz, swing, rockabilly, and indie music, have all dedicated themselves to bringing what they call the, "cleverly written, fun and romantic songs" of the World War era to grateful nostalgic listeners, and new audiences alike. 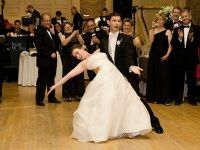 The show swings from the upbeat singles and jazz tunes to dance to, to those slow standards and ballads that melt the heart. Go to dance, go to since along, go for a good time, go because your grandmother used to play these records in your infancy, go because you are that grandmother, go to enjoy it with friends and loved ones, go to experience a new kind of music for yourself, but just go; you won't regret it. 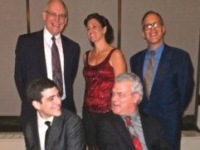 A Great Jazz Band For Hire In PA! 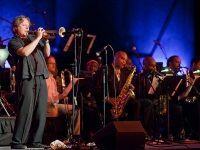 The Lars Halle Jazz Orchestra lays down the sound you've been searching for in Pennsylvania. This is one big band: lots of talented saxes, great horn-work, and a killer rhythm section account for its seventeen brilliant performers waiting to bring the best old classic sound to the modern day. But this is not a cover band; the Lars Halle Jazz Orchestra produces unique originals, blending a contemporary revival of jazz with the sensibility of the standards you love. 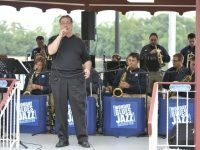 One of the greatest jazz bands for hire in PA is waiting for your call, so check out their website to hear for yourself, and be sure to get in touch for more information. The Art of the Jazz Band Lives On in Pennsylvania! The Brian Pastor Big Band is a rehearsing, travelling big band made up of some of the best jazz - brass musicians in the Tri-State Area! 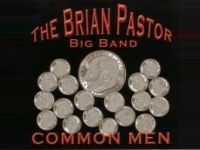 Headed up by Brian Pastor (hailed as "one of the premier trombonists in the universe") the band has played at events across the state, and even released an original CD in 2006 entitled 'Common Man." This is the band you want to book for a swinging good time, for the kind of toe topping, soaring swing and jazz that will keep your body moving in time, and your soul humming for hours afterward. These talented musicians, all dedicated to perfecting and sustaining the art they love, are well worth a listen any day. One of the Best Jazz Bands in Pennsylvania! Allan Pallor and his Band have been playing jazz music together for nearly twenty years; their repertoire covers all your favorite jazz standards, from imported ballads, to the great American songbook, straight on through swing, and ending in jazz, smooth or hot. The band will tailor its show to your specific needs, providing you with the kind of ensemble that suits your tastes, and guaranteeing an experience you and your guests will never forget. What can beat the class and style of live music, the songs that move your soul brought wonderfully to life by the talented and dedication of the people who have devoted their lives to it? Don't miss this opportunity to make one of the best jazz bands in Pennsylvania part of your next event. The Grooviest Local Jazz Band In PA! What do you look for in a jazz band? Is it talent? Experience? The ability to create a swinging show that burns itself into your memory forever? If so, the Barbone Street Jazz Band is the outfit you've been searching for, maybe without even knowing it. Every member of the band has spent decades (the average band age is a bit over sixty) honing the skills and sounds that go into creating a perfect jazz music experience. They'll play almost anywhere, at almost any time they aren't booked. They have brought the classic sounds to a new age and innovated, crafting a uniquely modern flare for their music. Don't take our word for it, try them out; you'll have to hear it to believe it. He Does Private Events & Piano Lessons! Are you having a party or event and are looking for a talented jazz musician to play at it? Then Lou Walinsky is the perfect Philadelphia jazz band for you! He does it all - solo piano and keyboard, along with jazz ensemble. Whether you're looking for a mellow jazz pianist or an upbeat jazz group, Lou Walinsky will perform for you! Not only does he do private events and parties, he also conducts piano lessons for musicians of all ages and abilities! Check out his website to see his outstanding credentials, and to find out why you should hire Lou Walinsky! 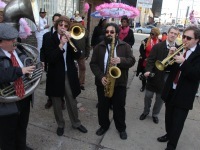 They Bring New Orleans to Philadelphia! With its enthusiastic and soulful jazz interpretations, Perseverance Jazz Band will impress you with its talented musicians. 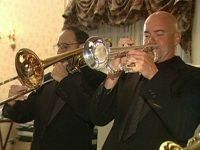 If you're looking for a one-of-a-kind jazz band to play at your wedding, then Perseverance Jazz Band should definitely be at the top of your list! 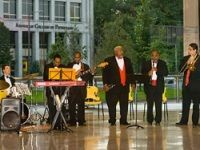 Performing in weddings, corporate events, outdoor festivals, bars and clubs, and more, Perseverance Jazz Band does it all! If you're interested in their wonderful jazz music, then go to their website and listen to their tunes! Also, take a look at their list of shows in the Philadelphia area, and make sure to go see one! 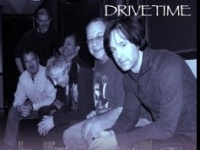 Many times bands will fall into the misconception that they must play "the norm" which is what happened to Drivetime, until their music began to evolve. Their music changed into a melting pot of funk, jazz, and dance club which leaves its listeners moving to the electrifying beat! Their website has many Albums, posters, t-shirts and other merchandise available for purchase. In addition, there are also a few free downloads, and videos available for its fans, all they ask for is an e-mail address! They have a list of upcoming shows on their website as well, the majority of which take place in Philadelphia and Doylestown, PA. So plan your next jazz show accordingly and make sure to include Drivetime in that planning! 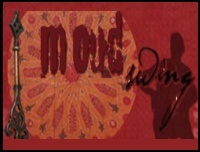 A Fusion of Arabic and Jazz! This unique style of music brings the smooth listening’s of jazz together with the upbeat percussion and woodwinds of Arabic tradition. Two uncommon instruments found in this band are the oud and doumbek, which are similar to a guitar and bongo, respectively. The band has been together for over 9 years and has toured in many parts of the US and even to Morocco and Europe. They set up shop in Philadelphia and continue to play the majority of their shows there, most notable the World Cafe Live. Their website has a schedule of show dates and locations. So if you're feeling adventurous, lend this jazz/Arabic band your ear and they will give you a new taste of music!